Snowboards for women: made especially for you! Snowboards for women used to be few and far between. Women would have to either ride the same snowboards as men or choose from a very limited selection of boards built specifically for them. As snowboarding continues to grow in popularity, more women and girls are coming into the sport...often showing men how to do it! As more women take up snowboarding the board manufacturers have started spending a lot of time and money on developing kit especially for the female side of the market. More snowboards for women are coming to the market all the time. Men and women naturally differ in areas such as weight, height and footsize. The snowboarding manufacturers have embraced these differences and are now building more snowboards for women with subtle differences that are specifically designed for females. All this technology and development means that women are now on an even playing field as men and are getting the best riding experience possible. Snowboards for women differ in a number of ways from those that are built for men. Firstly, due to women being smaller, the length of womens snowboards is that bit shorter. A lower centre of gravity in a woman has also been taken into account by the snowboard designers. Womens boards have a different flex and make up to give you the rider the best experience possible. 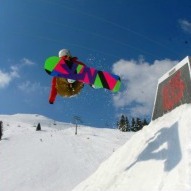 Smaller feet is also one of the main drivers in the different design of a womens snowboard. Boards for women are generally thinner around the waist of the board to ensure maximum control and responsiveness when riding. Overall the designers are doing a great job of ensuring women can progress as quickly in the sport as men and long may it continue. Even the smallest difference in snowboard design can completely change your riding experience and affect how you get along with that board. For this reason it is important to have a board that is built specifically for the type of riding you prefer. Snowboards for women specifically will be more responsive, comfortable and stable. It will be more fun to ride. Without one you may find some things more difficult than they should be hindering your improvement as a rider. As mentioned earlier, there are more and more womens specific boards coming to market. Below you can find a selection of this seasons snowboards for women for you to drool over. For a wider choice, more boards can be found at the best online shops article...enjoy! snowboard sizing - get the right size board for you! We hope this page has shown you the importance of having a womens specific snowboard if you are keen to get the most out of your riding. If you have any questions about womens snowboards and want to know more then please drop us an email through the Contact us page. JOIN THE CONVERSATION - WHAT BOARD DO YOU RIDE? Back to "Snowboarding home" from "Snowboards for women"
Back to "Buying your set-up" from "Snowboards for women"